Yes Willo don’t you wish you had one! King Hammond aka Nick Welsh (ex Selecter) is laying down some terrific sounds on a new album that will have you rudies reaching for the downloads. King Hammond will be appearing at the Ska weekend 2toneposters.co.uk is putting together for September 4th & 5th with Special Brew, Orange Street, The Refinements, TooT’n'Skamen, Skatonics and many more plus ska DJs at Folkestone Harbour. With All Or Nothing (Coventry) Scooter Club, South Coast Pirates Scooter Club etc. More details to follow soon. Not one to miss. 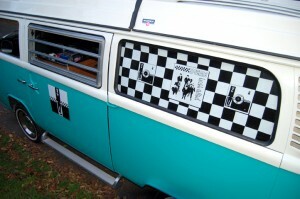 Pencil this in your diary for a great ska weekend day trip by the sea. 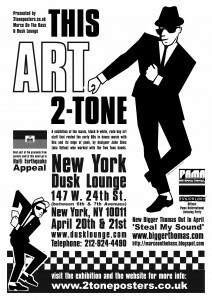 This ART 2 Tone exhibition goes to New York and ties in with the After Gig Parties at the Dusk Lounge in Manhattan to celebrate the two Specials gigs and the release of New York ska band BIGGER THOMAS and their great new album ‘Steal My Sound’. 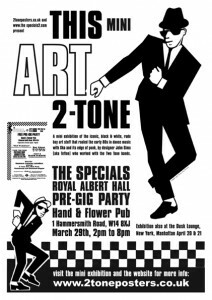 If you missed Margate, Brighton and Coventry here is a chance for a mini taster of the Rude Boy 2-Tone graphics along with the biggest meeting of specials2 website RUDIES. Skanking 2-TONE, SKA, ROCKSTEADY, MOD, PUNK sounds by DJ Tiddles, Boy About Town, Tone The Skin, Tony B Back ll Back, plus ska juke box. FREE ENTRY come along even if you don’t have ticket for The Specials at The Royal Albert Hall. This will have your feet tapping. You are currently browsing the classic 2-tone graphics news archives for March, 2010.